Save up to 84% today. Claim your discount. 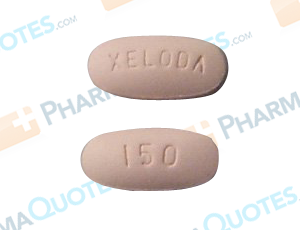 Xeloda is a medication used to treat breast, colon, or rectal cancer. It works by slowing and stopping the growth of cancer cells. This and other drugs should be used under the direction of a doctor with a complete and current list of medications and medical history, including allergies. Patients who have had an allergic reaction to 5-Fluorouracil or inactive ingredients commonly found in medications may have a reaction to Xeloda. Patients should talk to their doctor before taking this medication if they have a personal medical history of DPD, blood disorders, heart problems, kidney disease, and liver problems. This medication will affect your immune system. Avoid immunizations and vaccinations while using this medication. This medication may make you more sensitive to the sun and to bleeding. Avoid skin burns by wearing sunscreen and protective clothing during sun exposure. Avoid cuts, bruises, and injuries by avoiding activities such as contact sports. This drug may cause dizziness. Do not drive or operate heavy machinery until you know how Xeloda will affect you. Patients may also experience nausea, vomiting, loss of appetite, constipation, tiredness, weakness, headache, and difficulty sleeping. If effects worsen or persist, notify your doctor. Diarrhea is a common side effect while taking Xeloda. Hair loss and finger nail changes may occur and should return to normal after treatment has ended. Serious side effects can occur when taking this medication and should be reported to your doctor, including severe nausea and vomiting, and painful, red, and swelling sores of the mouth and tongue. It’s important to follow manufacturer, pharmacy, and doctor’s instructions when using this and other medical products. General Xeloda Warning: The above information is for informational purposes only and is not meant to be a substitute for professional medical advice, diagnosis or treatment. Please seek professional medical advice before starting, changing or terminating any medical treatment. Pharmaquotes is not offering medical advice, pharmaceutical recommendations or endorsing any specific prescription drug, pharmacy or other information on the site. Pharmaquotes provides no warranty or guarantee for any of the discount data, medication, or other information.